Animals that have either migrated to or been introduced in Central Europe, such as the Asian bush mosquito or the Asian ladybeetle, have adapted well to their new homes due to changing climatic conditions. If these newcomers are genetically compatible with local species, they may crossbreed and produce hybrids, which can continue to evolve under local environmental conditions—a process shown to have taken place during human evolution between Homo sapiens and Neanderthals, for example. New genes contributed by foreign species provide new genetic combinations that can be beneficial and are thus favoured by natural selection. According to hybrid swarm theory, interbreeding between hybrid species and parent species may then lead to divergent populations, and even to new species with novel characteristics. But how can modern-day science substantiate this theory and identify fundamental mechanisms behind such speciation? To advance knowledge about how animals diversify (adaptive radiation) to form new species (speciation), evolutionary biologists working with Professor Axel Meyer at the University of Konstanz and Professor Christian Sturmbauer at the University of Graz analysed cichlid fish from the Lake Tanganyika ecosystem in East Africa. "This study, our largest in terms of data volume and level of collaboration since we began working together in 1990, has finally allowed us to reach a near-complete understanding of the evolutionary history of these fish as well as the processes that led to the formation of the Lake Tanganyika cichlid adaptive radiation," says Axel Meyer. With more than 1,700 species identified worldwide, of which several hundred are endemic to Lake Tanganyika, cichlids are a model animal system for the study of rapid and therefore difficult-to-explain species emergence. The researchers were not only able to resolve the relationships between the most contested branches of the cichlid family tree and explain the cichlid's rapid early radiation in Lake Tanganyika, but they were also able to shed light on the much-discussed chronology of events relating to cichlid speciation. Their research results were published today in the renowned scientific journal Nature Communications. By collecting cichlid fish DNA and sequencing more than 500 selected fish genes via cutting-edge genomic sequencing techniques, the research team was able to establish new evolutionary trees for the East African cichlids and explain why new species sometimes appear in bursts. The researchers found that even at the beginning of the oldest cichlid radiation, environment-induced hybridization between the colonizer lineages produced innovative forms, which then expanded rapidly under stable conditions, thus boosting the speed of innovation and species development. In regard to the evolutionary development of modern cichlids from Lake Tanganyika and in accordance with the hybrid swarm theory, the research team discovered that a cichlid species from the Lower Congo River reached the lake and interbred with their lake ancestors, thereby facilitating the adaptive radiation of the cichlids in Lake Tanganyika. This river cichlid is no longer physically present in today's lake, but could be detected via genetic information in the other diversifying lineages. 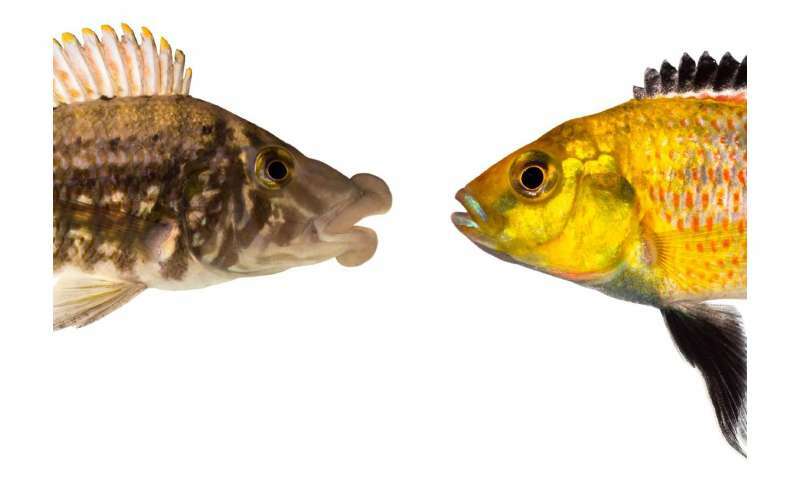 Some cichlid genes—such as those influencing body colouration and specialisation of the jaw—diversified more rapidly, and are associated with the colonisation of new lake environments. "It is those characteristics that are exposed to selection that are responsible for the development of new species," explains Christian Sturmbauer. Using the latest anchored hybrid sequencing methodology, the research team was able to show for the first time that the jaw innovations of cichlids are crucial in terms of providing the fish access to previously unexploited food sources. The researchers were also able to shed light into the much-discussed chronology of events (timetree) relating to cichlid evolution. Up until now, studies that used molecular clock calibrations resulted in ages that were either too young or too old, and which were generally problematic to reconcile with the geological history East Africa. Using a set of fossil calibrations that includes a newly discovered fossil anchoring the Tanganyikan radiation, the research team carried out a new molecular clock analysis that for the first time reconciles the split of the southern Gondwana continent with the chronology of the sinking of the East African Rift Valley where Lake Tanganyika cichlids evolved together with the maturing lake ecosystem. "These findings may help us understand, for example, ongoing changes induced by climate change in the animal kingdom," says Sturmbauer.